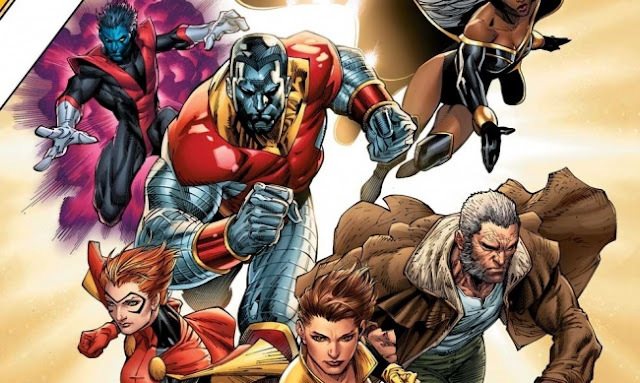 The X-Men Blue and Gold teams are back in the latest Marvel relaunch, this one titled ‘ResurreXtion’, revolving specifically around the X-Books, and the lineup of comics that spring from them. Fresh off the heels of last week’s X-Men Prime issue, which was a bit of a wheel spinner if you ask me, we jump right into the re-introduction of a more classic team of X-Men, to wet our appetite for the future samplings to come in the line. So does Marvel, Guggenheim, and company accomplish the goal this issue of generating a renewed interest and in turn getting everybody to buy into this new status quo? Let’s find out. Things start out with our team lead by Kitty Pryde who’s joined by Logan, Nightcrawler, Storm, Colossus, and Rachel Summers (now going by Prestige) face to face, with what would normally be considered a more galactic type foe in, Terrax. Kitty immediately gets to work displaying her more than adequate leadership abilities commanding the team in various ways to save the day in the end defeating Terrax with little resistance. 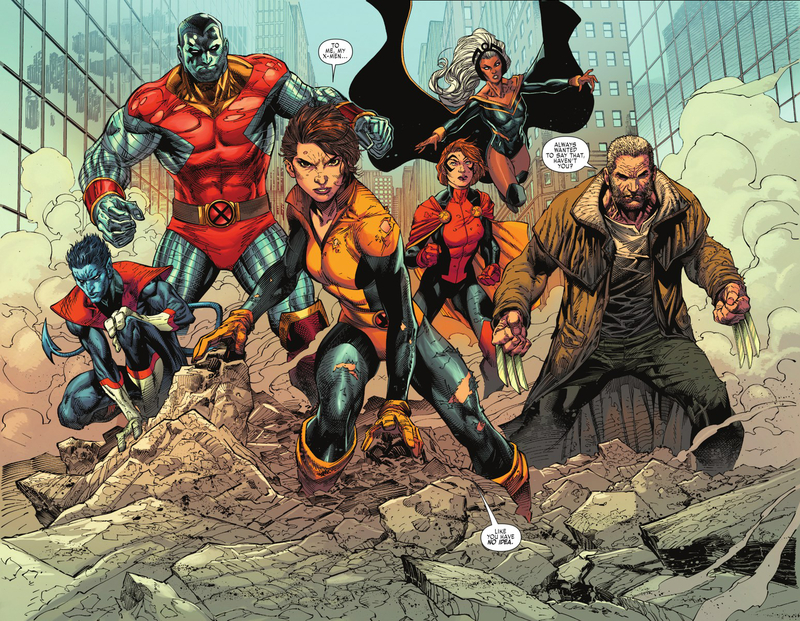 Despite the ‘bad guy’ being corralled by the X-Men for all to see, the citizens of the city display their outward prejudice towards the team, setting the stage for Kitty to accept responsibility for the X-Men’s actions of late, in the end promising a better tomorrow, through their actions, to everyone present. The second act of our story slows the pace, goes heavy on nostalgia, and sets the stage for the reader to get an idea of the mindset behind the different characters highlighted on this team. Kitty accepts her new responsibilities head on, Old Man Logan reveals his softer side to his teammates which Wolverine rarely showed in the past, Storm and Nightcrawler reflect on the X-Men’s current status in society post ‘I v X’, while Colossus pursues Kitty in a romantic way looking to rekindle lost love. 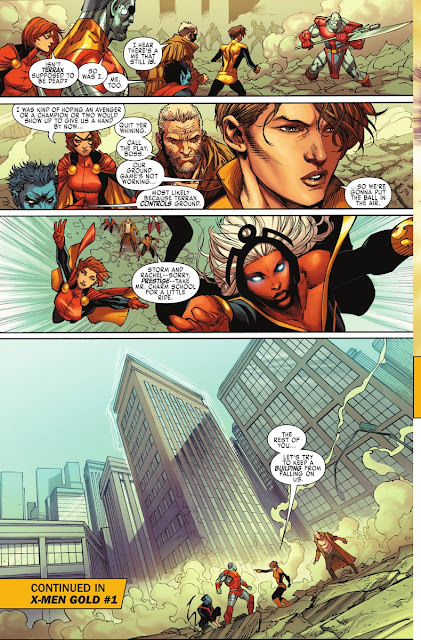 Prestige gets a few page spotlight, which highlights the reason for her name change, while she mentors a few younger X-Men in the Danger Room. The issue winds down as the team is abruptly called off to a location, to help deal with a distress call in the area. In classic X-Men fashion they take the jet and arrive on scene only to quickly discover they’ve been called to confront a team mascarading as the Brotherhood of Evil Mutants, as the book comes to a close. With all things considered X-Men Gold #1 really felt like a pilot episode to a TV show that briefly sets the stage for future events after taking a majority of the time to set up characters motivations early on. There’s nothing wrong with the dialogue or context of what Guggenheim is saying but some of the story choices and scene transitions, especially in act two, feel jarring as we jump from one situation to the next very quickly. Obviously the art has become a topic of controversy over the weekend, others much more eloquent than myself have commented on the situation so feel free to make of that situation what you will. All controversy aside though the character work looks very solid, the action comes off clean, and is very easy to follow throughout, so the artistic work to my eye is no doubt enjoyable to look at. However my general feeling about this title is something felt a little bit off to start for me. It’s really the forced nature of some of the story decisions. I don’t like the X-Men owing the city 18 million dollars in rent and taxes (how will they raise this money short of winning the lotto? 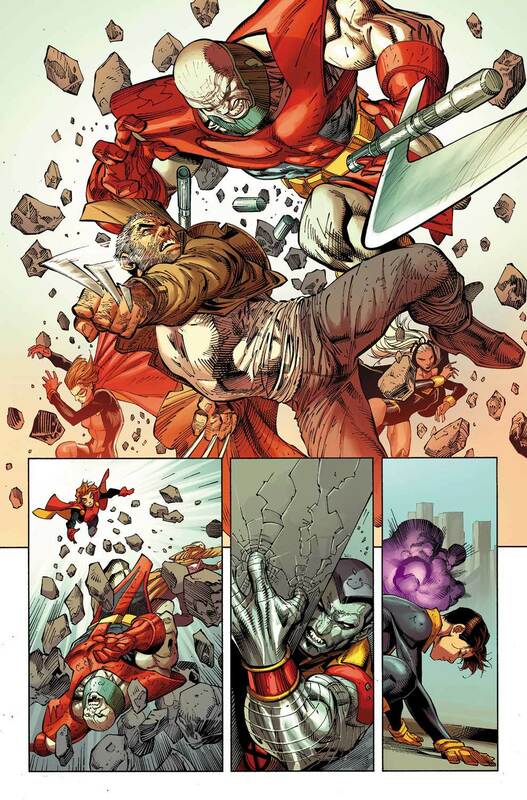 ), or the writers decision to shove the Colossus and Kitty romance into our face already. The later decision especially reeks of going for nostalgia, for nostalgia sake, just too early ... it’s not something that's occurred naturally at any point yet these characters literally just got back near each other. Not to hammer on things or make it seem like I didnt enjoy the title but I also don’t love to much how the topic of prejudice was forced in and pushed throughout this issue. I understand this is a staple the X-Men as a group will always deal with, but fresh off the heels of Death of X and 'I v X', I just wanted to get some classic Good Guys versus Bad Guys action for a while, and not have these lingering social issues constantly infecting every story all the time. 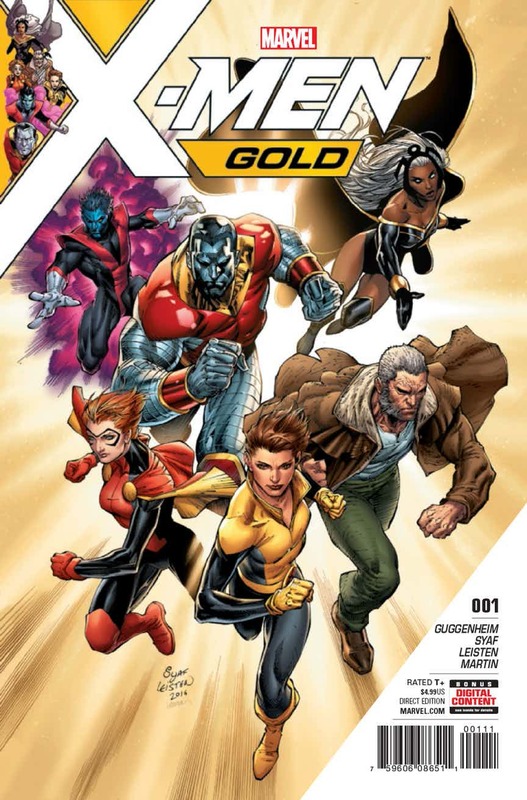 X-Men Gold #1 brings a more classic group to the forefront, in an issue filled with enough callbacks to please any easily satisfied X-Men fan who’s seeking a nostalgia trip. So far though if you’re looking for something with more of a fresh feel to it involving this group of much maligned heroes some of the future books may be more up your ally.